This month, I’ve been writing about some of the spectacular places we’ve seen, and I’ll end where I began – in Chile. 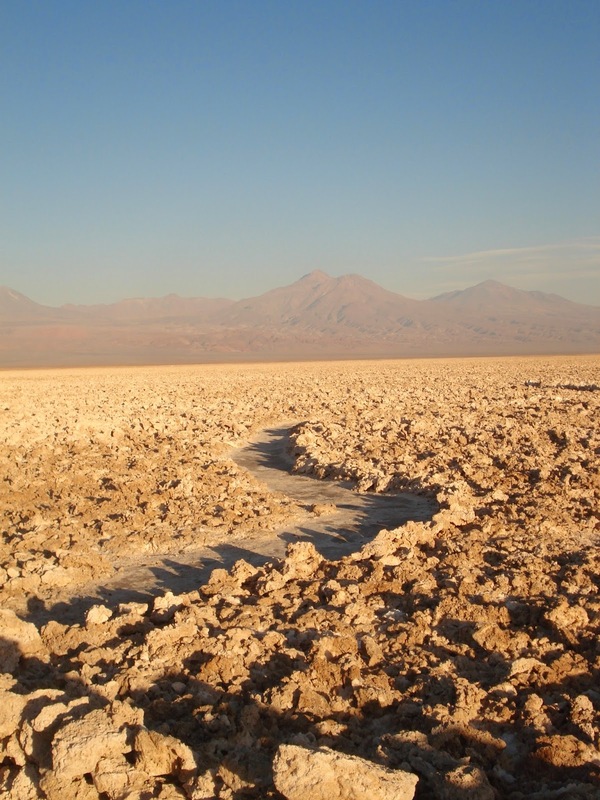 The Atacama desert in the north of Chile is home to a number of salt plains, one of which is the Chaxa Lagoon. Craggy mounds of hardened salt thrust up from the earth for miles and miles, extending to the border of the distant mountains. 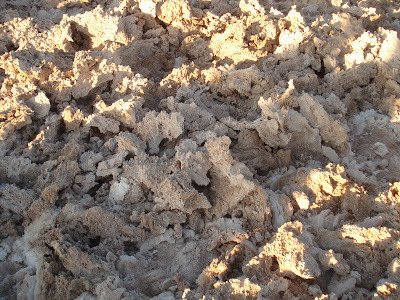 These salt crystals were left behind after the evaporation of underground water. The scarcity of rainfall in the region, and the absence of a place for water to drain, have enhanced the strange beauty of these saline formations. Thanks to the microscopic life in the lagoons, the flats are home to a wide variety of birds, some of which are endangered or vulnerable. 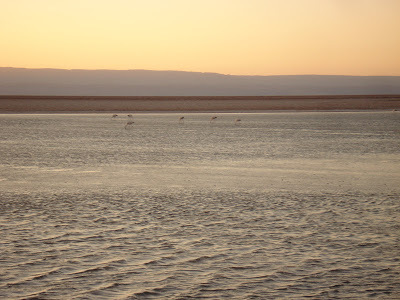 The area is particularly known for the flamingoes that live there, and has been designated a nature reserve. Your photos are just stunning. As a writer, I can imagine that a place like Chile is a source of great inspiration for you. It's so vast and the terrain so unique. Lovely! Oh im sooooo glad you enjoyed Chile; and your pictures are georgeous!!! I love that poetry, especially "gem salt." The terrain looks like a blank canvas, full of inspiration. Another wonderful trip you've shared with us! Beautiful landscape! Fantastic photo's! The landscape is so interesting,so stark but beuatiful, nonetheless. Beautiful! The quotes are so perfect at capturing the essence of salt, and her barren, yet lovely home. What an absolutely cool landscape!! Wow, another fabulous locale that I can add to my bucket list. 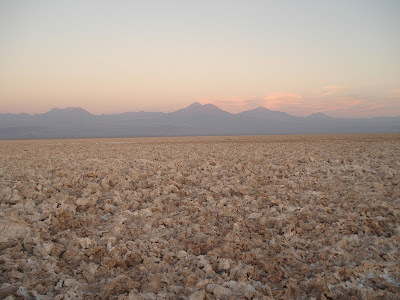 The salt plains with the mountains in the background is just breathtaking~ Have a wonderful weekend, Beth! Have I ever told you that I have travel envy? I've never seen anything like those flats! Wow, that is definitely a unique area of the world! Such different beauty. 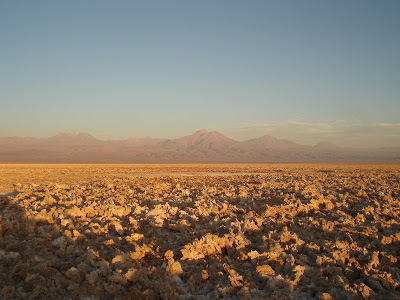 Your photos are lovely and they remind me of the salt flats near Salt Lake City, Utah. Amazing photos, Beth. And you really have seen the world! p.s You may have noticed that my blog didn't work last three days, now blogger finally fixed the problem and my blog works fine now. 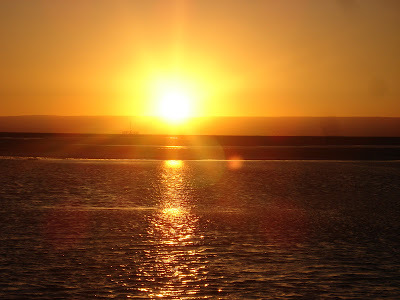 This is a unique sight to behold and the sunset over the water photo really captures the desolate feeling of this nature reserve. You have really seen some wonderful parts of the world! So stark and yet to beautiful. They almost look like coral. Very pretty and unusual. I love the poetry of Pablo Neruda. It takes good mothers to raise good daughters.